First Lady Laura Bush helped launch a screening facility in Saudi Arabia Tuesday as part of a U.S.-Saudi initiative to raise breast cancer awareness in the kingdom where doctors struggle to break long-held taboos about the disease. Bush's trip to Saudi Arabia, her first to the oil-rich kingdom, is part of a regional tour that aims to highlight the need for countries to share resources and unite in the fight against breast cancer. "Breast cancer does not respect national boundaries, which is why people from every country must share their knowledge, resources and experience to protect women from this disease," Bush said in a speech at the King Fahad Medical City in Riyadh. 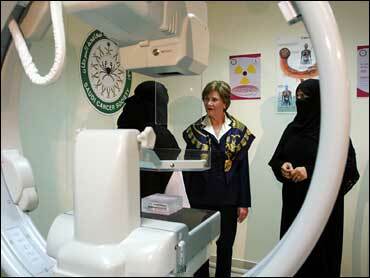 "The cure for breast cancer can come from a researcher in Washington or a young doctor in Riyadh," she added. Bush, who wore a navy blue pant suit, arrived in Riyadh from the United Arab Emirates, her first Mideast stop. Visiting female dignitaries are not required to don the traditional black cloak that all women in Saudi Arabia must wear in public. She was greeted by Prince Faisal bin Abdullah, the king's son, who is honorary president of the Saudi Cancer Society. Bush visited the Abdul-Latif cancer screening center, the country's first, where she met with Saudi women affected by breast cancer. She later witnessed the signing the U.S.-Saudi Arabia Partnership for Breast Cancer Awareness and Research agreement at a packed auditorium at the King Fahad Medical City. Saudi became the third country to take on the program, which was organized by the State Department and includes the Susan G. Komen Foundation with MD Anderson Cancer Center in Texas, Johns Hopkins Medicine in Maryland, the United Arab Emirates and Saudi Arabia. Before the agreement was signed, Dr. Samia al-Amoudi, who was diagnosed with breast cancer in April, spoke about the pain she felt when her 10-year-old daughter asked her if she would one day be stricken with the same disease. She said she told her daughter "hopefully you will be able to tell your children there was once a disease called breast cancer that killed women, but it no longer is the problem it once was." Al-Amoudi, a gynecologist, said about 70 percent of breast cancer cases in Saudi Arabia will not be reported until they are at a very late stage, compared with 30 percent or less in the U.S. She also said 30 percent of Saudi patients are under 40 years old. Al-Amoudi said many of the hurdles in Saudi Arabia are not medical. For instance, until recently, it was widely considered socially improper to refer to the disease by name in the kingdom, she said. "People would refer to breast cancer as 'the bad disease' or 'that disease,"' said al-Amoudi. "But today, when we talk to the highest levels of authority or are speaking in front of all kinds of media about this issue we name the disease for what it is: breast cancer," she added. Dr. Abdullah al-Amro, head of the King Fahad Medical City, said that almost one-fifth of all women with cancer in Saudi Arabia have breast cancer. Bush, whose mother and grandmother suffered from breast cancer, was also scheduled to meet with King Abdullah and with breast cancer survivors during her visit. She will then travel to Kuwait, where she will meet with women democratic reformers, legal advocates and business leaders. Laura Bush last visited the Middle East in 2005, stopping in Jordan, Egypt, Israel and the Palestinian territories to promote freedom, education and the role of women.